Whether you work in a hospital, an ambulance, or on the battlefield, a good pair of trauma shears is an essential part of your equipment. Trauma shears are used to cut through every type of material from clothing to metal and even occasionally bone. To withstand this kind of punishment, shears need to be made of the toughest materials possible with extremely high tolerances. We’ll go through our 3 top picks for the best trauma shears for any occupation. While Leatherman Raptor Shears have all the tools for field work, it is hard to justify paying extra for an entire toolset that is not needed in a hospital setting. X Shears have the same extremely high quality blades that mark the Raptor without all the extra tools that increase the weight and the cost. X Shears are made for frequent use in hospitals, and they solve all of the major problems associated with the Leatherman Raptor. They are easy to clean, can be autoclaved, do not rust, and are lighter weight. Pros: Easy to clean. Autoclavable. Do not rust. 90-day, money back guarantee. 5 year warranty. Use our discount code to get 10% off all X Shears products at XShears.com. Just click the link below, copy the discount code, and type it into the discount code box at checkout. Made from 420 high carbon steel, these trauma shears are built to cut through the toughest materials. But other shears make the same claim for a less expensive price point, so what’s the difference? 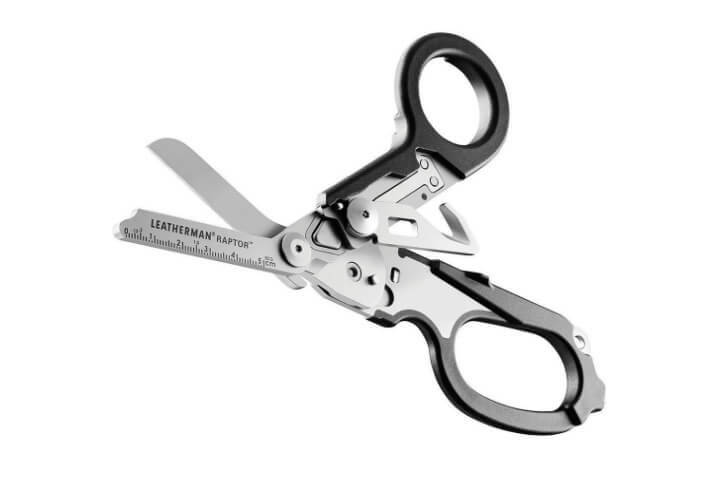 Leatherman built its reputation in the multitool world with groundbreaking inventions like the Leatherman Wave, and it has done the same thing for trauma shears in the medical world. The 6 featured tools on Leatherman Raptor shears are designed to account for any situation where trauma shears are necessary. Although these shears are a great purchase for first responders and military personnel, they have some downsides that make them impractical for hospital staff. The variety of tools, folding pieces, nooks, and crannies make Leatherman Raptor shears difficult to clean, and they cannot be autoclaved. The tool set is also not designed for hospital use; glass breakers and strap cutters are usually reserved for extractions in the field. The other impracticality for hospital staff is the weight. Without a belt holster or MOLLE straps Raptor shears can be uncomfortably heavy for pocket carrying. Comes with your choice of either a MOLLE compatible holster or EMT belt holster. Trauma Shears: 420HC Steel. Angled for cutting across flat surfaces. 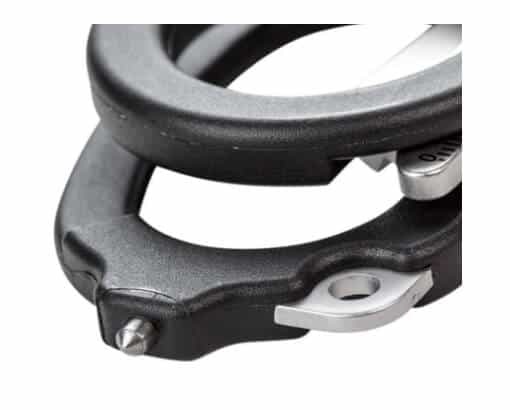 Ring Cutter: Slim enough to fit between swollen skin and tight jewelry. Carbide Glass Breaker: Built into the tip of the large handle. Pros: Adaptable functions for a wide variety of situations. High quality, trusted, American-made brand name. 25 year warranty. Collapsible for easier carry. Cons: Not autoclavable. Difficult to clean during frequent use. Develops surface rust on blade. While Leatherman Raptor Shears have all the tools for field work, they may be too expensive and cumbersome for working in a hospital where all you need is a light pair of trauma shears that clean easily. 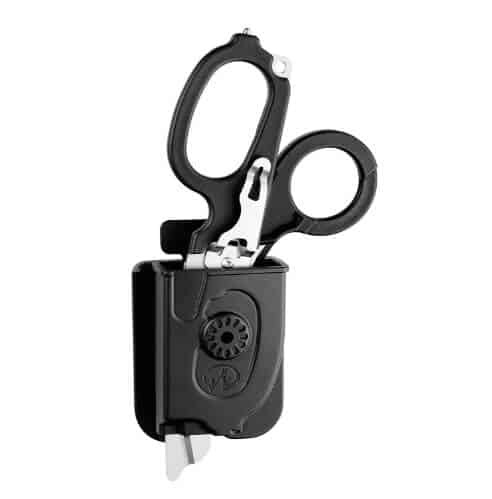 Madison Supply makes an excellent value pair of trauma shears for daily use with fluoride coated blades to prevent tape from gumming up your scissors. The shear handles are on the big side. This could be a good or bad thing depending on how large your hands are. For nurses and other hospital staff, X Shears may be the best fit as many of the Raptor’s tools are unnecessary, plus frequent use and the fact that the Raptor cannot be autoclaved makes cleaning and sterilization cumbersome. Also, in hospitals specialized tools are immediately on hand, so the higher price for a multitool is not justified. 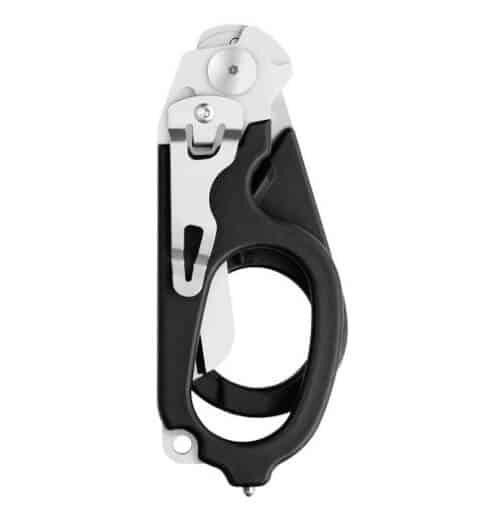 For EMTs, firefighters, medics and other field personnel, Leatherman Raptor shears are an excellent addition to prepare for any situation that might arise. If people keep “borrowing” your trauma shears permanently, Madison Supply makes a fairly high-quality set of shears for a low price.